Each Split Silk Classic Volkswagen will be driven by one of our smartly presented Chauffeurs. They will be on well equipped and prepared to provide support for you on your journey, we aim to help you deal with any of those last minute needs. Eddie and Rio look fabulous dressed up in their wedding day best. Wedding day hire will ensure that you have exclusive use of that vehicle on that day. Included in the hire price are front and rear bumper garlands decorated in a neutral colour scheme, plus ivory or white ribbons. We can provide an additional service to enhance these and colour coordinate them to your requirements. 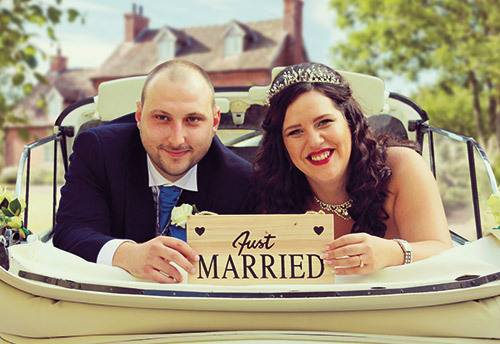 Split Silk happily provide a complimentary bottle of chilled Prosecco for the Bride and Groom with any of our vehicles, enabling you enjoy a post ceremony private celebration on the way to the reception. Alternatively, your choice of champagne can easily be provided for an additional charge. A non-alcoholic alternative will happily be provided if preferred, at no extra cost. Each vehicle will be readily available for any photographs during the day. Should your ceremony and reception be at the same venue, a relaxed drive to a suitable local photographic location can be easily accommodated.